The choice of a theme for your blog is a very personal decision. The good news is that there are hundreds (perhaps thousands) of themes available to choose from ... this is perhaps also bad news is a way. It's all to easy to begin the search for a theme only to end up spends hours jumping for page to page, and site to site reviewing features, styles and layouts. May I offer the following post on Blogger Buzz as a starting point for your journey. My personal Blogger template walkabout ended with the discover of the Mystique by Digital Nature. While the theme was originally developed for WordPress, it was converted to a Blogger them for WP Blogger Themes. 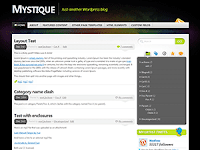 There is a demo of the Mystique theme hosted on Blogger for your viewing pleasure. As our participation in a wider number of online systems increases it can become a challenge to maintain our identify. While the a simple approach is to use the same username on all of the systems, this approach is not always possible, or reasonable. In part because you may share the same name as a number of other people. I've actually been a bit surprised to find so many people who share my own name. Why bother you may ask? It is becoming common for potential employers, clients and even online friends to review a persons background. This was motivation enough for me to put a nameplate website online to provide a focal point to manage my online identify. Following the basic steps outline in the Lifehacker article Have a say in what Google says about you I put together a nameplate page up on Tumblr, ed.orcutt.org. The content of the nameplate site should be basic, just your name, profession, location and email address. In addition I've added links to major sites on which I have a presence: Google, Facebook, Twitter and LinkedIn. Setting up a page at Tumblr could not be easier, and it's free. There are hundreds of web page themes to choose from thanks to so many generous designers. In addition, you can edit the theme is you want to in order to improve search engine optimization (SEO). Perhaps a good topic for a article in the future.